Thirteen dwarves, a hobbit, and a wizard are walking to a mountain. While this may sound like the start of a good joke, it is actually a key point to JRR Tolkien’s, The Hobbit. 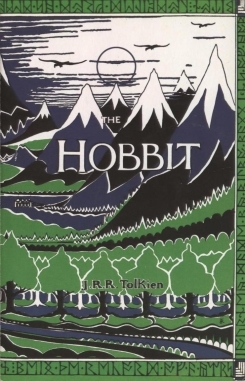 The writing of this brilliant novel originally began in the 1930s and I think it’s a safe bet that Tolkien had no idea people would still be reading it almost a hundred years later. The Hobbit follows Bilbo Baggins of the Shire as he is swept off on a journey with Gandalf the wizard and thirteen dwarves: Fíli, Kíli, Balin. Dwalin, Oin, Gloin, Dori, Nori, Ori, Bifur, Bofur, Bombur, and their leader, Thorin Oakenshield. Lost yet? I definitely was when I first started reading and I will admit it took me several tries to get past the first couple chapters because I kept getting confused. However, I am incredibly happy that I finished the book because it is just as amazing as I had always heard. The Company are on a quest to take back The Lonely Mountain, a place that was once home to the dwarves before it was taken by the dragon, Smaug. They are traveling across rough lands in the world of Middle Earth, a magical place created by Tolkien. On their journey they encounter elves, goblins, and a creature that some of you may know (hint: My precious). They must fend off orcs, spiders, and giants made of stone. All the while there is constant chatter about food (or lack thereof as the dwarves like to point out). JRR Tolkien truly produced a masterpiece with this novel. His descriptions of the land and the distinctions between the characters helps the reader to visualize what is happening. He has created an entirely new world that is both a confusing and wonderful place to get sucked in to. I didn’t want Bilbo’s journey to ever end because I never wanted to leave Middle Earth (Thankfully I have The Lord of the Rings waiting on my bookshelf for me). An incredible novel for everyone. It is something that you can read on your own or to children for a bedtime story. Tolkien has created something very magical with this novel that I would highly recommend to anyone. Have any tips for how to make the review better? Have anything you want reviewed?